I looked at your documentation to try to get more information into what these options in this menu do. I found a lot on how to use it, and what each of the options are for, but it did not explain what the impact would be on utilizing these settings? For example, I know that it doesn't run code coverage or static analysis, but does it also have an impact on stubability, meaning that it will fail to instrument the code in such a way that it can utilize stubs already created? When I add resources to this menu, I still see, during the running of a test executable, these files being "instrumented". There is not a lot of information in your manual on what exactly instrumentation does, and so does this mean that there are different types of instrumentation? Are there varying degrees of instrumentation? I was able to get the tool to successfully scope once using this tool. However, it seems that even though I changed the scope settings again, it is not picking up my changes. In order to scope, we added the folders as resources in the Settings GUI. I have deleted coverage from the GUI, deleted the .cpptest folder, deleted all extraneous information from the .parasoft file such that it is the same as prior to changing any scope settings, and yet, I can not get the new project to update the scope settings to accept my latest changes. Is there something else that I need to change/delete in order to get it to work? There seems to be a discrepancy between the scope settings that are executed at the test case level versus the Project level. It seems that settings do get updated at the Project level, but for some reason do not get updated at the test case level as that run is choosing to run an older, previous scope configuration. Why is there a difference in scope settings between the 2 levels? From your description, it is not clear where the problem is. Perhaps it would help if you could describe what are you trying to achieve. On an Eclipse project that contains 200+ virtually linked C/C++ and header files, along with 100+ stubs, we are only trying to collect code coverage on a very small subset of the files (say 5 files). What would you recommend as the easiest way of obtaining this information and what settings/properties must be configured in order to obtain a report with only coverage on those 5 files, while maintaining enough instrumentation to allow stubs to still function as they do normally? Helper question: What kind of testing is done on your project? Unit Testing or Application Coverage Monitoring (system level tests). What you could do is to have separate instrumentation settings for "test files" and "additional" files. You can select instr. settings for those two categories of files in the test configuration->Execution->General->Instrumentation mode->Edit. What you can do is: disable "C/C++ Code Coverage" for "Additional Sources" and leave stubs instrumentation enabled. For "Tested Sources", you probably want to have all instrumentation features enabled. Now, tested sources will be all source files which were either directly selected in the project tree when starting the session or source files indirectly selected by selecting the test suites which are correlated with those source files (correlation is done via CPPTEST_CONTEXT macro in the Test Suite file). By default all the source files from the project which are not "Tested Sources" become additional sources. 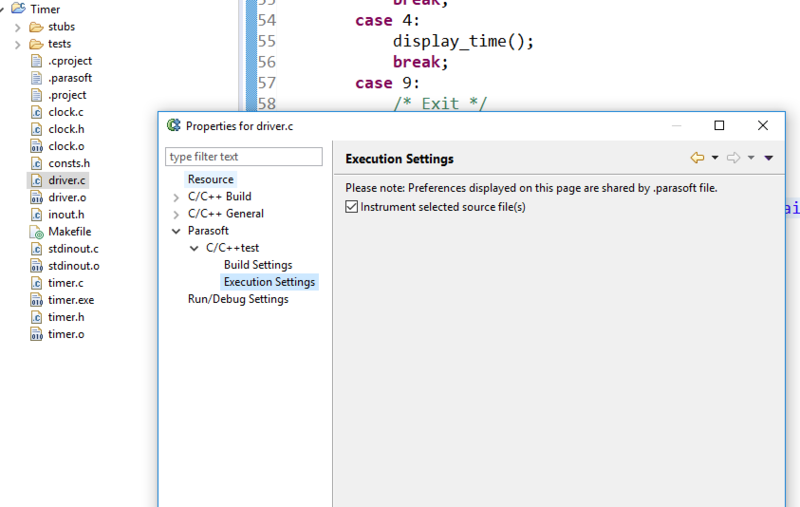 This behavior can be changed in "Test Configuration->Execution->Symbols->Use symbols from additional project files"
Uncheck the "Instrument selected source files"
It will completely remove all instrumentation including stubbing, main function renaming, and all coverage types.